The concept of bioelectricity emerged in the late 18th century, based on the experiments of Galvani and Volta. Sixty years ago, Hodgkin and Huxley showed that the nerve impulse is a result of permeability changes of the nerve membrane. This raised the question as to what the molecular mechanisms of such permeability changes might be. 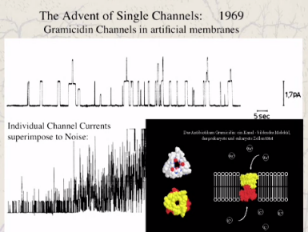 In 1976, Bert Sakmann and I were able to show that so-called ion channels – proteins, which gate ion fluxes across membranes – mediate these responses. Research over the last 30 years has shown that ion channels are present in basically all cell types of our body, mediating a variety of physiological functions; that they are prime drug targets; and that dysfunctional ion channels cause a variety of diseases.